Holi is around the corner. The festival of free spirits. The festival of fun and frolic, and of bountiful colors. But unfortunately, the festival of colors has also turned into a festival of chemicals. The free spiritedness of Holi also gives rise to total lack of rules on the streets. 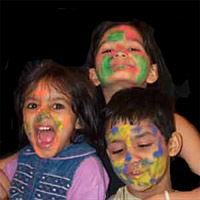 It is only natural that parents of little angels are as apprehensive as they are excited about Holi. How do they see Holi, and more importantly, how should the kids celebrate Holi? There is no doubt that kids should be introduced to the Indian culture and festivals. It brings in them a sense of belongingness, and a larger understanding of the society they are a part of. So I would suggest the ideal way to celebrate Holi, or any other festival for that matter is a story. Yes, the mythological story of Hiranyakashipu, Holika, Lord Narsimha and the little Prahlad. I have included a kid-appropriate version of this story at the end of this article. Finally, the day of colorful, playful holi comes. You and the kids are ready with their pichkari to soak and color everyone in range. If you can, refrain from using colors and gulals till your kids are a little older. 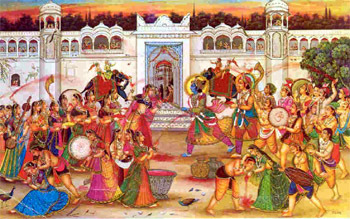 The colors and gulal used in holi are essentially chemicals and can have serious side effects . For example, red is mercury sulphite, green is copper sulphate, purple is made from chromium and bromide compounds and black has lead oxide. Their usage can lead to skin irritation, allergies, hair loss, edema and erythema and even blindness. You can choose to play with natural colors or with plain water. There are a lot of ways to create natural colors – you can use turmeric, beetroot and mehandi (henna) for common colors. You can be creative and make even more colors from household stuff. Ensure that you speak to the parents of his potential playmates so that they also play holi without these chemicals. However, it is always better to prepare your children in case others are playing with these colors. A generous helping of cold cream on the body, and oil on the hair and scalp should help. Clearly instruct your child to close her eyes if someone applies gulal on her head or face, or throws colored water towards her. With these precautions, you can be sure your child is going to have a fun-filled holi with memories to last a lifetime. Once upon a time there was a evil demon-king called Hiranyakashipu who was very proud and arrogant. He considered himself the most powerful one in the world, and ordered everyone to worship him, instead of Lord Vishnu. However, his own son, Prahlad was a very good boy, and a devotee of Lord Vishnu. This made king Hiranyakashipu very angry, and he asked his sister, Holika to get rid of Prahlad. Now, Holika also had a secret power. She was immune to fire, so that fire could never burn her. So, she took Prahlad with her, and sat in a huge bonfire. But Holika forgot that fire is a very dangerous thing, and everybody should be very careful near the fire. So Holika burned, and died. However, little Prahlad was continuously praying to the god, and so was saved because of his devotion to Lord Vishnu. Later, Lord Vishnu took Narsimha avatar and killed the evil king too. So, every year, we burn a bonfire on Holi, to remember that one should always be good, believe in god, and should always be careful of fire. What a wonderful version of this story for children...will be sharing it with my children this year. Thank you!